Lately I've been contemplating the awesome power of claiming the word 'witch'. As I approach thirty, many of the lessons I've learned along the way become clearer to me with the profound tool of hindsight. I would like to share some of my challenges, realisations and struggles with you from this point on my personal journey. Here they are in ten tasty slices. Best served with a pot of herbal tea. One thing which only began to become clear to me in my late twenties was how much the craft could inform my daily interactions and responses in positive ways. I made a video a while ago about the importance of using your power outside of the circle and recognising that you are a witch all the time. This rang truest for me in my realisation that I don't need to RSVP to every argument I'm invited to. I don't need to lower myself to someone else's standards or make waves when it is all the more graceful to walk away. I began to realise that putting my voice to a conflict could sometimes do more harm than good. I began to be more selective about which situations and relationships to involve myself in. Practicing the craft encourages you to wield your power, know your purest intentions and direct your will in the most effective way. It teaches you to be the supreme master of your energy and to respect your energy completely. This knowledge began to bleed beautifully into my life itself. I realised that forgiveness, grace and love hold potent vibrations and that they were pathways which were just as available to me as anger, resentment, disappointment and bitterness. I made dramatic changes to my emotional energy expenditure and learned the difference between resisting a problem and allowing a solution. Here's a clue - the latter is more productive and more peaceful. That's two for one! My journey has involved designing my own unique methods, aligning them with my sincerest beliefs and combining them with my imaginative faculties. I wanted to be inspired and excited by my craft and I wanted it to be a reflection of my greatest attributes. I didn't want to stop at what I found in books but to combine the juciest of that stuff with whatever was rattling around in my own mind. I needed to connect with my sense of internal permission in order to do that, and now I make a strong point of teaching others to do the same thing if they feel called to do so. You can find some of my thoughts and loving lessons on this topic here, here and here. 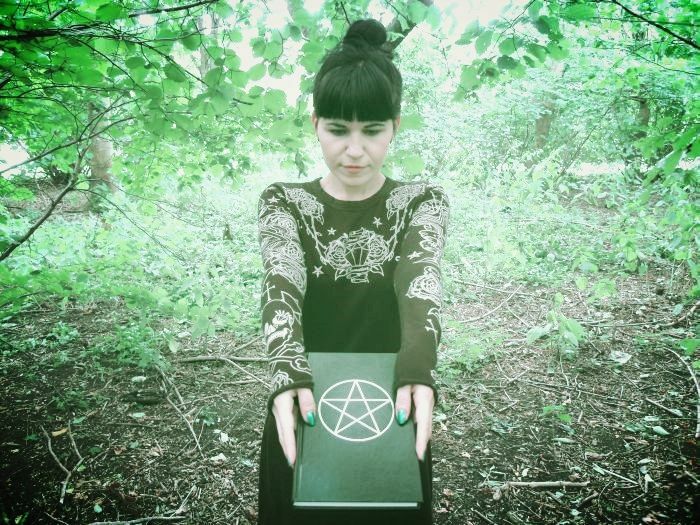 I realised that it is my duty as a witch to find what works, to go where I feel empowered and to push my own boundaries in an attempt to connect with my divine feminine and masculine in a whole host of magickal and marvellous ways. I learned that whatever switches me on outside of the circle could be brought into the circle to great effect. In the end, the only thing that held me back was my own sense of restriction. Once I released that, there were no limits! I learned that my body is a vessel for my life force and a tool for directing that life force effectively in magick. I also learned that it was a key 'piece of the puzzle' where self-love, self-acceptance and empowerment were concerned. I learned this lesson quite late in my spiritual journey after many years embroiled in self-injury, an eating disorder and chronic pain stemming from a back injury. I used to say, at the height of my back pain, that if I wasn't in my body, I would kick my body. After many years of directing so much hostility and resentment towards my physical being, I realised that I would need to start loving, accepting and appreciating it before it could really be free of pain. As I took the first tentative steps on that journey, I witnessed increased magickal powers and increased ability to connect during rituals. I witnessed increased ability to use and enjoy my five senses as well as significant improvement of my sixth sense. A eureka moment which was over a decade in the making! The body is not just some hunk of flesh which moves me from place to place and towards which I can channel my rage. Wrong - so wrong! My body a sacred tool for enabling the ultimate enjoyment of life. It also helps my mind to direct my energy in accordance with my will. When the mind and the body are fighting against each other, the mind cannot work as effectively. If what I do as a witch really matters at all, then what I do most often is help people to heal. Years ago, when I was in the throes of mental anguish and drowning in the behaviours which went along with that, I would not have believed that I would one day call myself a healer. It would have seemed like a total impossibility. For me, being a witch is about knowing that each one of us puts a little ripple upon the water of life, and that ripple spreads outwards. We each choose the nature of our unique ripple. Mine is a ripple of healing which I usher outwards into the cosmic web with as much love as I can generate. Why? Because I've been down and I came back brighter. I believe that other people in the grasp of pain, confusion and difficulty can do the same. When I was thirteen years old a Tarot deck came into my possession. I was instantly transfixed. This was no accident. In fact I might even choose to see it as the moment that the universe gave me the name 'witch'. As I grew older and emerged from my own personal hell, it occurred to me that the undeniable power of Tarot should be used to effect positive spiritual change in the outside world. When I qualified as a counsellor, I knew that Tarot would be my tool of choice. I wanted to consistently take its messages and turn them into realisations, actions, sweet surrenders to the beauty of existence, both in my life and other people's. It is in my counselling work that I bow most sincerely and consistently to the spiritual path that I have chosen. Here are the ways you can work with me if you feel called. I believe that helping people effect change in their lives requires a knowledge of spiritual alchemy and how it works. Spiritual alchemy is the most powerful form of magick. I look at everything through the eyes of a witch these days. I don't see time in my spiritual pursuits as being markedly different from my time talking with friends, watching a sunset, making a cup of tea or laughing at a funny movie. The potent interconnectedness of all things is never far from my mind, body and soul. I walk in oneness. I see the ways in which things are tied together. I dive through the psyche and the treasure that I bring back is firmly planted in the world around me. I can move beyond my own ego to adopt different perspectives. I don't see separation anymore. Why should I when I know better than that? I am always wearing my 'magickal unicorn horn'. That's my little turn of phrase which is intended to imply that I put my witchy eye over all things, witnessing their majesty and considering how I might use that understanding to deepen my craft, improve my relationship with myself and make my mark on the world I inhabit. Some people say that being a witch is about doing. Others say that it's about thinking. Some say it's inborn. Others say it's learned. I believe it is all of those things and more. The mind is the beginning, the middle and the end. I came to a place in my journey at which I decided that any and all knowledge could be beneficial to my craft. I realised that there is really no such thing as 'witchcraft study'. It's all relevant, it all matters - art, politics, science, economics, religion, psychology, languages, health and nutrition, philosophy, history.. The entire spectrum encapsulates what it means to flex the magickal muscle of the mind. Whenever I put my mind through a tough workout, I know that my craft has benefited immensely regardless of the subject matter. I keep pushing myself, testing my hypotheses and delighting myself with each connected dot, each fresh realisation.. I don't want my practice to become stale and stagnant. I want to deepen the meaning of what I already know but I don't want to get comfortable there. When I am a little apprehensive about moving beyond a certain boundary, I remind myself that it means there's some good stuff out there! I have learned not to be ashamed of the word 'witch' and not to hide it away. Of course I am sensible about throwing it around in different kinds of company, but that comes through common sense rather than through lack of ability to own the word and speak lovingly of its importance when called to do so. I am an ambassador for the word itself and I believe that claiming it has helped me to be an integrated human being and to reach a point of self-actualisation which has been vital to my enjoyment of life. That's something to shout from the rooftops! This doesn't mean that those who reside in the broom closet should be accorded less respect. On the contrary, holding the word dear to you isn't really about anyone else. It's about how you feel and how you incorporate the word into your life. Much love and blesséd be.